Yesterday, I downloaded a few small, amazing, beautiful, first person, art games / experiences from itch.io, and WOW!!! ..and umm.. No, it's not the sky.. ..They all use Unity FPS character controller! Note: This post contains solutions to 3 most jarring problems, there are 'no-code' involved solutions and 'recommended' solutions involving slightly more work. If you don't care about reading about the tech behind the issues, you can skip 'The Techsplanation' parts and just jump straight to 'The Solution' titles. Also note: I am talking here only about the 'FPSController', not 'RigidbodyFPSController', simply because it is simpler and rigidbody based controllers are a totally different issue altogether. You may have noticed that the player walks on a few steps more when the button is released. 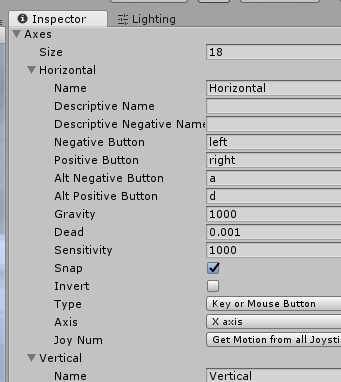 Now, there are a few ways of getting keyboard input in Unity, and one common solution for 'polar' inputs, like in our very example moving left and right, is to create a virtual axis, similar to a gamepad stick analogue input for example, but instead actuated by buttons. 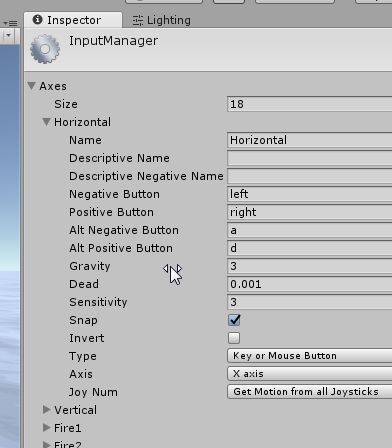 Unity creates a few axes by default, including 'Horizontal' and 'Vertical', which are typically used for player movement. The way to get these inputs in code is by calling Input.GetAxis(axisName) or Input.GetAxisRaw(axisName). In the gif above, you can notice that the axis input (white line) is rising and falling smoothly over time, that is because of the less-known Unity input manager features called 'gravity' and 'sensitivity'. Since the input of button press is either 0 or 1, these two parameters are used to smooth out 0 to 1 transition to simulate an analogue axis in a better way. 'Sensitivity' is how much the number will rise on key press, while 'gravity' is how much it will fall off after release. By default, gravity and sensitivity are both set to 3, which means the value will be smoothed over 1/3 seconds. That is exactly what we see in the plot above. We can infer that this is a part of the issue, because the player's velocity drops only when input reaches 0. But, smoothing inputs still doesn't explain the reason why the FPS controller behaves like that. If the value is smoothed, then the movement should be smoothed too, right? The point of interest is at the very end: '.normalized'. This means that vector of any length is converted to it's unit length (length of 1). For example, if the vector was initially (0.2, 0, 0), it will become (1, 0, 0). And hey, there's the source of our problem!! Since the input manager smooths the value of x, it will jump to 1 immediately as soon as the button is pressed, and not be lower than 1 until the 'gravity' drops the value to 0, which happens after 1/gravity seconds. Now, normalizing the input is not an error, there is a reason why you would want to normalize input vector, and it has to do with vector addition. If you press both right and forward keys for example, these two values will add up in 2D plane and the resulting vector length will be larger than 1. It will be the length of a diagonal of a square (square root of 2 to be exact). And that exactly is the cause of the infamous diagonal strafe boost. This problem was very common back in the day of early FPS, most notorious maybe in GoldenEye 007 for N64 where you could storm through levels a lot faster than enemies could touch you. BUT! A very very bad consequence of normalizing the input axes, is that, any analogue input will also be normalized. So, if you are using a gamepad stick for movement, the player will always move at a constant velocity, even if you touch the stick lightly. The problem here is that whoever made the character scripts might not have been aware of input smoothing, or they set up high values for gravity and sensitivity in the input manager without thinking that A LOT of people might not be aware of it, aaaand.. they did not test with a gamepad. A simple solution for keyboard users would be to make sensitivity and gravity in Edit > Project Settings > Input Manager for both Horizontal and Vertical axes be very high, like 1000. This will make the controller snap to 1 and 0 right away and will not have any 'stickiness', but the controller will also have no velocity smoothing, it will stand or move at constant velocity. It also doesn't solve the gamepad issue where it does not have any velocity control. A much better solution with a little coding, is to remove normalization, and instead clamp the vector to 1 to prevent vector addition exceeding 1. Now however, this doesn't solve the issues perfectly, there is still tiny 'stickiness' when holding both forward and a strafe key, but it's minimal, and a very good compromise. If you are not intending to make a fast action or competitive game where input precision is extremely important. Additionally, it would nice to now increase gravity and sensitivity a bit, for example to 6, to increase responsiveness. This also solves the gamepad issue, you can now precisely change movement speed with analogue stick. A different, perhaps even better solution would be though to not be connected to input gravity and sensitivity at all, instead, post-smoothing the normalized input value, for example with Vector3.SmoothDamp(). This would also introduce a little bit of inertia, which is nice in my opinion. There is another very annoying and distinguishable issue, especially noticeable as stutter when strafing and rotating the view at the same time. This comes down to the temporal discrepancy between the calculations of controller's movement that is calculated in fixed update, and camera rotation which is calculated in rendering update. Now, you see, Unity's physics and rendering are calculated separately in 2, lets say, 'time-spaces' (I avoid to use 'threads' in fear it may be programmatically incorrect), and they run at different rates (aka timesteps) in parallel. If the VSync is enabled, the rendering rate depends on your display device's refresh rate (for most screens that is 60hz), while the physics update rate is defined in the Time Manager. By default, fixed timestep is set to 0.02 seconds, which means it is updated at 50hz (times per second), which is less than a typical screen refresh rate of 60hz. As a result the refresh rate is actually faster than refresh rate. This means that at certain render frames, physics is not calculated, but is the same as in the last physics step. As you can see, some frames lie completely within physics updates, and therefore, there is no change between the 2 consecutive frames. In those frames, the controller doesn't change position, it simply freezes, and that is where the 'jerk' happens. A quick fix would be to go into Edit > Project Settings > Time Manager and decrease the 'Fixed Timestep' value to at or below the refresh rate. I like to set this value to 0.01, which means physics will run at 100hz. But be very careful! Because modifying the fixed timestep will actually increase the rate of all physics calculations in the scene. If you have a lot of rigidbodies, or a lot of FixedUpdate() calls, this may have a big performance hit. For most small, art games / experiences tho, I think this is not an issue. But note that this still doesn't solve the issue because of a number of reasons, user devices with different refresh rates, fps may drop (or raise if VSync is off). Also, when fixedupdate runs twice or more in some update frame (the inverse of the graph above), you will now experience speedup-jerks basically. But that is much less noticeable than previously encountered freeze-stutters. Another solution, recommended for games that do not have any other physics interactions, would be to move the entire character movement calculation to Update(). Put 'CharacterUpdate();' line at the end of 'Update()' function. Find and replace 'Time.fixedDeltaTime' with 'Time.deltaTime' in the CharacterUpdate() function. Now, the character movement and rotation will be always in sync with refresh rate and there won't be any stutters. Obviously, it's clear how it uses the 'Bobcurve' to interpolate movement over distance. The problem is that the Bobcurve just gets sampled with time. And additionally, it starts and ends abruptly, snapping from curve (when moving) and original position (when standing still), jerking the camera. A mysterious spike at the beginning of the landing. The jerk is not visible in gif due to gif's framerate, but I can guarantee you it's very noticeable when playing. Another 'solution' is to use my, currently temporary, simpler head bob solution, that I wrote today, and which is SmoothDamp based. It never jitters but it's a bit harder to tweak at the moment. It reacts to landing after a jump as well as to steps, naturally, as a response to character's velocity. It only has vertical bob (just since I personally don't prefer horizontal bob). But I am still working on improving it. These three are just the most annoying issues, there is a bunch more that I may talk in another post, like stairs, slopes, bashing your head into a ceiling, CharacterController weird sleeping issues, etc.. Also, pressing space when in air will make you jump once you land. Whyyy? Also that your project gets infected with CrossPlatformInput, which is useless for non-mobile games. Thinking of these, you could even write a book.. There's enough material. I would say 'make your own controller', but speaking from experience, making a first person controller and solving all edge cases is not a trivial task at all. I spent a muuch longer time on my own than I initially thought. And I'm not even talking about rigidbody based solutions. I think these few quick fixes are better than 'make your own'.. Unless you are really making some competitive, precise game. But what I'm really disappointed about is that Unity hasn't fixed any of these issues looong time ago. 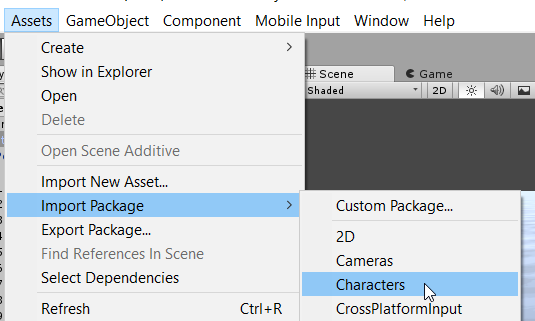 I remember this came with Unity 5 as the 'new and improved' character controller, (actually, as far as I remember, I'd say it was a downgrade) and it still has these ridiculous issues. People that never touched code now make amazing games thanks to Unity, and inadvertently infect their games with this controller. ..I know I know, the sky too... but cmon, it's not as bad as this. Thank you for taking the time to write this up and the visualisation of the various values really helped. Looking forward to the next blog post. thanks so much! I enjoy those art, aesthetic, atmospheric, games on itch too! And while trying to make my own I ran into this post and its EXACTLY what I was concerned about! Procedural mesh generation is very demanding both on performance and memory. Hence, it is very useful to know how it works under the hood and every trick on how to improve it to eventually, make better, stutterless experiences. I was motivated to write this post to clear up some misconceptions that I found all over the webs, be it official Unity docs, various posts, rants, and non-webs like things I was yelled at told are "absolutely correct". I will try to add as much as possible of what I have found over the years and present profiler-proof which is, of course, "absolutely correct". By casting this little bit of doubt, we can begin..
2 years ago I made Norman's Sky, a terribly made parody of the likenamesake, a spaceship-flying procedural generated infinite universe game, which I made in 10 hours for a jam after an almost mental breakdown. I hated the game at first, but over time my opinion of it drastically changed as it became a joke on it's own. This is the story of how it all happened.